"If you're not striving for originality, then why bother?" - Jason Adams Devium welcomes Corey Duffel and his freakish ways to their enlistment of Deviants. Congrats Duffman! Visit deviumusa.com for more info. Bro Style‘s first official trip. Into the heart of Gnarkansas! Check the article (and cover) in the Transworld 2016 April issue. Matt Bennett had his trusty VX on the Bro Style Sickness Brothers trip. Check out the Matt B-Sides! Article in our April issue out now,video coming soon! The bros from Bro Style came down and high fived the #TWSPark. Stay tuned for the Sickness Brothers video. Article in Transworld April 2015 issue out now. Any Kubrick fans out there? 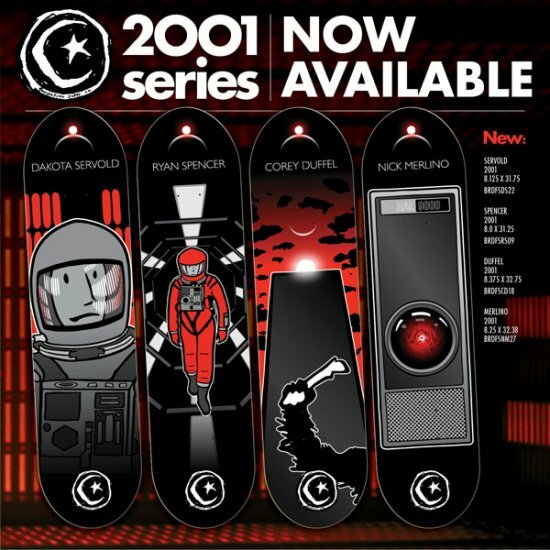 NEW 2001 a Space Odyssey Ⓕ series is out now! Demand from your local skateshop or purchase here.